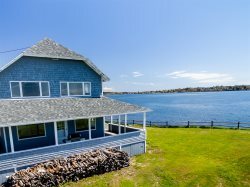 From bold open ocean views, rugged Maine coastline, and easy water access via a shared beach, to a fresh, new interior, beautiful spacious yard, and convenient location just minutes from all the Harpswell Islands have to offer, "The Little House" is the perfect cottage for your island getaway! Recently renovated in 2015, this waterfront cottage has everything you want and need for your vacation to Maine including a fully stocked kitchen, a comfortable living room with cable TV and internet, a full bathroom with a walk-in shower, a bedroom with twin bunk beds, another bedroom with a twin bed, and a master bedroom with a queen bed, all with stunning ocean views. You will enjoy waking up to the sun rising over the ocean and spending your days outside making memories swimming and kayaking from the small beach area, playing in the yard, and sitting by the ledges sipping on your favorite drink while dinner sizzles on the grill. In the afternoons, you will love walking to the many local restaurants nearby including Morse's Cribstone Grill and Cook's Lobster & Ale House, and then ending the evening with a delicious Maine ice cream cone from the Island Candy Company. There are endless opportunities for adventure and many memories to be made at The Little House! Come enjoy all this island retreat has to offer! Regarding the Owner's Pet Policy, dogs under 35 lbs are welcome and dogs over 35 lbs must be approved by the owner. The Little House does not have a washer and dryer, but there is a laundromat in Cook's Corner (15 min away). This is the second time that my husband and I, along with our GoldenDoodle have stayed in The Little House. We love being right on the water and enjoy the water views from every room. It's clean and comfortable and the perfect location and size for us. We can easily walk to other places located on both Orr's and Bailey Islands, yet we like the general privacy of the house at the end of the road. We will return again and that says it all!